Borovets Ski Resort (in Bulgarian: Боровец), known also as Chamkoria (Чамкория) until the middle of the 20th century, is a popular Bulgarian mountain resort situated in Sofia Province, on the northern slopes of Rila, at an altitude of 1350 m. This is the first and oldest Bulgarian winter resort with a history that dates back to 1896. Borovets was originally established at the end of the 19th Century as a hunting place for the Bulgarian Kings. Tsarska Bistritsa is a former royal palace located just above the resort of Borovets wich served as the hunting lodge of Tsar Ferdinand of Bulgaria. It was only in the 1930s, that skiing started becoming popular and Chamkoria naturally became associated with winter sports and holidays. Huddled amid the century old pine forests on 1300 m. of altitude Borovets is the perfect place for winter sports and vacation. The climate in the resort is soft, the winter is mild with lots of snowfalls. The average temperature in January – the coldest month of the year, is about -4,8 ° C. The ski season normally starts in mid-December ending in April. The resort offers excellent opportunities for winter sports: alpine skiing, snowboarding, ski running, freestyle and freeride. Stunning winter landscapes, sun and of course a large variety of ski runs – a total 24 with an overall length of 58 km. The trails are of all levels of difficulty and load and are equally suitable for beginners and experts and everyone in between. Borovets has hosted twice the World alpine ski cup and twelve times the European cup, the most recent one being in February 2016 ( giant slalom for women). Borovets is a challenge and favorite place for snowboarders, too. 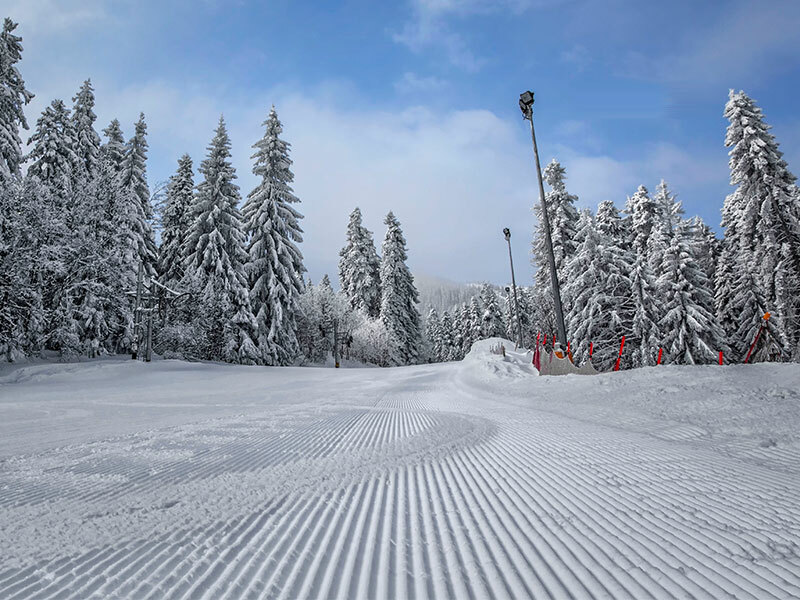 In Borovets they can find terrains with various types of complexity and load as well as two terrain parks – Snow Park Borosport in the upper section of Popangelov trail and Promo Park Borosport in front of the Rila hotel in Central Borovets. 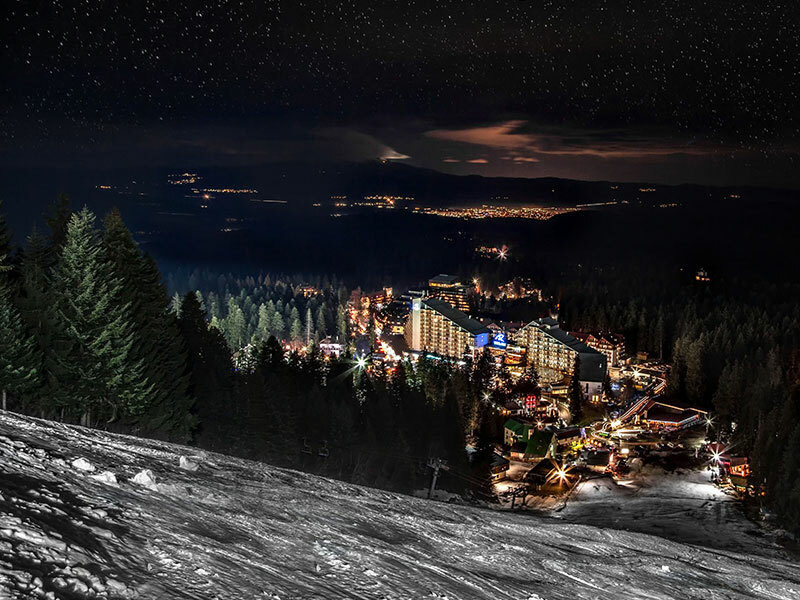 Borovets Ski Resort features 3 ski centers: Ski center Sitniakovo – from 1350 m. to 1780 m. of altitude. Its snow production system services an overall 2.500 ha of ski runs. This is also the night skiing center of the resort on its eight trails with electrical lighting – Iglika, Rila, Martinovi Baraki 1,2,3 and 4, Rotata and the lower section of Sitniakovo ski way. This is also the center which features one of the two freestyle parks in the resort – Promo Park Borosport. Yastrebetz ski center – from 1340 m. to 2369 m. of altitude. Its snow production system services Popangelov (former Yastrebetz 2), Yastrebetz 3 and the lower section of Yastrebetz 1 trails on an overall 2.500 ha area. In the upper section of Popangelov run is situated the second freestyle park in Borovets – Snow Park Borosport. Ski center Markudjik – from 2144 m. to 2550 m. of altitude. The center is equipped with an innovative snow fence system which prevents snow loss in windy weather. In high season the snow cover here reaches 2 m. high. providing excellent opportunities for extreme riding. *Feel free to Contact us if you have any other questions. *Enjoy your Ski Holiday with Us ! *Get in touch – Click Here !